On 25 March 2012 SPICE director Sr. Margaret Wong with Canadian volunteer teachers went to Beichuan to carry out Sichuan English Teachers Professional Development. At the same time 13 Hong Kong school representatives went to Sichuan from 28 - 31 March conducted Distance Classroom workshops, supported by UNESCO Hong Kong, for 20 Beichuan IT personnel and technicians from 20 local schools in Mianyang. 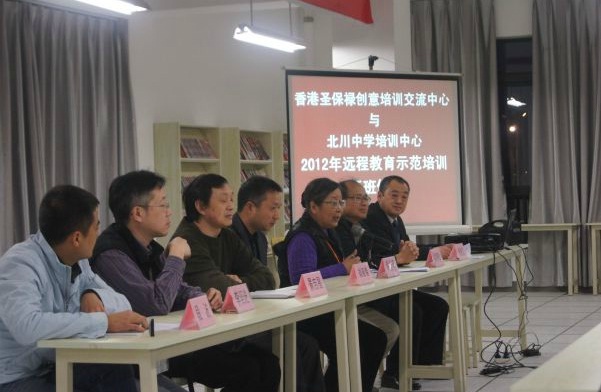 A demonstration session on English teaching in St. Paul’s Convent School on 29 March was streamed over to Beichuan High School. Later, Hong Kong representatives visited Mianyang schools and established online communications with their linked school at their Hong Kong school site. Participants experienced the power of technology in facilitating meaningful exchange among schools. Sr. Margaret Wong continued the journey to Gansu and visited No. 5 Middle School in Lanzhou and further exchange with school there.